Jade was formed by nature, deep in the earth’s crust under high pressure and temperatures, a process that has taken millions of years to complete. Jade refers to two mineral species, Jadeite and Nephrite. Jadeite (silicate of aluminum and crystaline) is found mainly in Burma. The Nephrite (silicate of calcium and magnesium) found in British Columbia, Canada has made it the Jade capital of the world. Jade has been the official gemstone of British Columbia since 1969. The rough stone is mined primarily in the northwestern region of the province. Nephrite jade ranges in colour from white through various shades of green, and on occasion, even black jade is found. Typically, B.C. jade is a medium to deep green colour. Due to the hardness of the stone, jade must be laboriously carved by a lengthy procedure of cutting, grinding and polishing. Once the artist determines their design, as much of the excess jade as possible is cut away with diamond tooth saws. After initial roughing out of the piece, the final form is achieved by a slow process of grinding and polishing. The final polish is accomplished with the aid of a diamond dust or other abrasive compound. 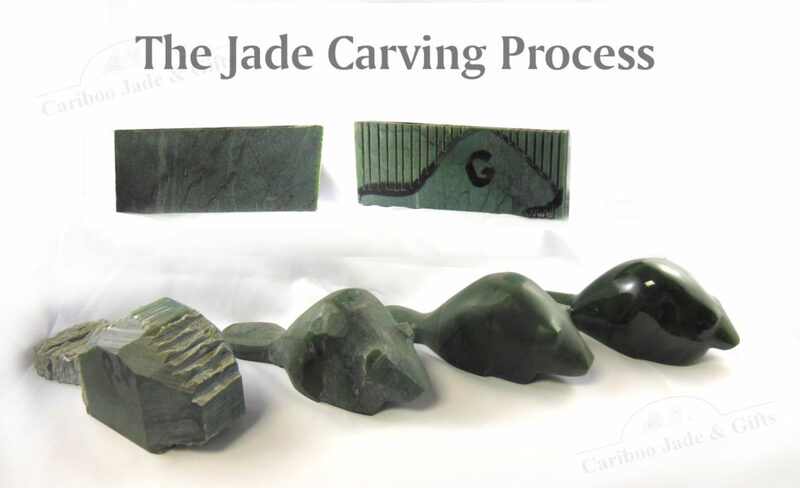 The steps of the nephrite jade carving process. The very qualities which made jade such a difficult stone to carve also account for its appeal as a carving medium. It takes a great deal of time and patience to work jade, but once the natural beauty of the stone is revealed in its finished form, you have a collector’s piece of lasting value. Jade, prized in the Orient and throughout the world, carries a legend that is believed to have mysterious powers of restoring good health and bringing tranquility and good fortune to its possessor. Traditionally linked with serenity; jade is a stone of balance, peace, harmony and good fortune. It is also recognized as the traditional gift for celebrating the 35th anniversary. The cabochon cutting process – From initial shaping to final polish.